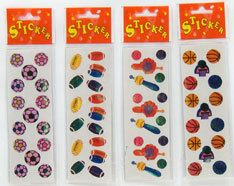 A lively assortment of sports ball themed stickers. Includes football, soccer, baseball, basketball. Sold per dozen sheets (over 200 various images). Bagged 1 dozen. $0.65 per dozen for 200 dozen or more. $0.57 per dozen for 400 dozen or more.